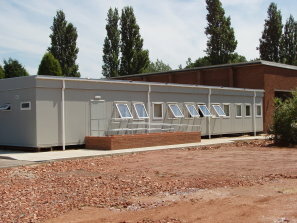 Located in Bedford and commissioned by a National Building Materials Manufacturing Company, this purpose built Modular Building complex consists of 14 No. individual prefabricated modular bays and provides a much needed accounting centre (405 sq. metres) for the staff to manage the national accounts for the company. The design of this Prefabricated Building provides one large office area of 375 sq. metres which incorporates a suspended ceiling system with Cat II lighting. Toilet facilities, including a fully equipped DDA compliant disabled toilet and a fully equipped kitchen are also provided. The office area is carpeted with high quality carpet tiles whilst the toilets and kitchen have a hard wearing, heavy duty vinyl. Externally, the walls are finished with easily maintainable plastisol steel and the roof is constructed with our standard duo pitched roofing system and covered with a hard wearing "Hypalon" blanket. A hot/cold air conditioning system keeps the rooms at a constant temperature. Internally, the walls are finished with a vinyl faced plasterboard and the internal doors are all solid core timber with closers and seals. Helping accounts departments work in comfort!